If you missed the open house last Sunday at the Oktibbeha County Heritage Museum, then you missed a real treat. Thank you to Bill Poe and the museum’s Board of Trustees for organizing an event to recognize three Hall of Fame athletes with ties to our area. The museum has organized three lockers with memorabilia for each of the three athletes: Cool Papa Bell in baseball, Jerry Rice in football and Bailey Howell in basketball. How incredible it is that we can claim a member of the Baseball Hall of Fame in Cooperstown, New York, the National Football Hall of Fame in Canton, Ohio, and the Naismith Memorial Basketball Hall of Fame in Springfield, Massachusetts! Bell still has relatives in Oktibbeha County, including Allen Landfair who attended the museum’s open house. Jerry Rice needs no introduction. The San Francisco 49er legend is widely considered to be the greatest wide receiver in NFL history and among the greatest NFL players at any position. Rice began his football career at Moor High School, now called East Oktibbeha, and soon to be part of the Starkville Consolidated School District. Rice’s mother, Eddie B. Rice, and his sister, Eddie Dean Harris, represented him at the museum’s event. Bailey Howell won two NBA championships with the Boston Celtics and still owns nearly every meaningful record at Mississippi State over half a century after his college career ended. Unlike Bell and Rice, who were children here, Howell did not grow up here. But fortunately for us he chose Starkville as his home after his playing days and raised his family here. Howell is a living legend among us, and he made a personal appearance at the museum event. I get goose bumps whenever I see him. He pointed to a picture in the museum’s locker display in which he was scoring a basket. From behind, failing to block his shot was Wilt Chamberlain. Laker stars Jerry West and Elgin Baylor, who Howell said was the most difficult person to guard in his career, were looking on. His Celtic teammates Bill Russell and John Havlicek also are in the frame. That picture is worth a thousand words. Don’t miss it when you go to the museum. Too often, communities fail to recognize their own. 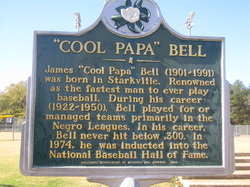 Unfortunately, Cool Papa Bell did not live to see his feats celebrated in his hometown. But today, we honor his accomplishments and those of living legends Jerry Rice and Bailey Howell. All three blazed a trail in their sport, and fittingly, we can all learn more about them now at the Oktibbeha County Heritage Museum. What a great sports legacy we have!